The development of the foot from birth to adulthood does go through a process in which bones develop with position and growth. The infant foot does have many bones that are even formed yet. 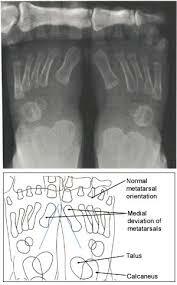 X-rays of the infant foot will show entire bones in the middle of the foot which appear to be missing. However, what is not seen is small areas of developing bone that will grown to full size bones at different times during development after birth. Abnormalities can been seen on x-ray even at a young age, if they are present. Abnormalities include abnormal growths, extra bones, and abnormal alignment of the the bones that are visible on x-rays films. These abnormalities can lead to symptoms such as pain, fatigue, visual deformities, and difficulty walking. Most children will walk with what looks like a flat foot. Since not all of the bones are developed in the infant foot, there is a lot of fat present in the foot that allows the child to walk. However, even though there is a lot of fat and the foot looks flat there is a discernable arch present in the foot that can be recongnized by a foot and ankle specialists. Eventually, the arch should begin to become more apparent as the child grows and the bones begin to form and take shape. Genetics play a large role in the childs foot, and if one or both parents are flat there is a stronger chance that the child will also be flat. There are some children who walk on their tip-toes because it is a behavioral issue. This is usually an only child or the youngher sibling of an older child and their goal is to be closer to the height of their parents and/or their sibling. In this type of child one would see the child at times walk normally when not around taller people or when no one is looking. Then there is the child who walks on their toes no matter what. They either are high up on their toes or they look like they are bouncing when they walk. This type of walking has to be evaluated carefully because the end results can be bad on the foot once the child gets bigger the structure of the foot will start to change based on the abnormal function of the musculature causing the toe walking. The rotation of the child's foot can also be affected by development. There are various factors determing that development from position within the uterus before birth and seating and sleeping positions after birth. If the child's feet are noticeably turning inward then an evaluation by a specialists may be necessary. If the child is excessively tripping causing other bodily injury or diffuclty with normal activity then an evaluation should be considered a necessity. There are various causes for in-toeing and should be ruled out and treated accordingly to improve activity level and prevent further injury. Pains in the lower extremities can occur for a variety of reasons. The common misconception is that the bones hurt while they are growing in childrem and possibly because those are moments when the bones are growing the most. However, the bones do not grow at such a rapid rate that would cause such pain. Typically it is because muscle and/or ligaments are tight and creating retriction in the movement of bones and/or joints causing abnormal stress and wear and leading to pain.